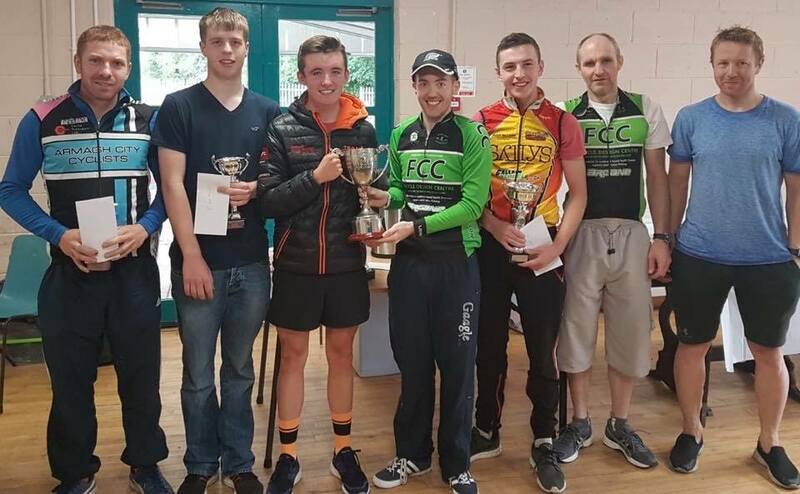 Fintona Cycling Club promoted the Patsy McElhatton memorial road race yesterday. The 38 miles event was in memory of the club founder and long time President and also came as the club marked its 50th anniversary since its foundation. Riders tackled the ascent of Fivemiletown mountain twice on the lumpy circuit with the summit on the second occasion also serving as the finish. Around 20 riders remained in contention after the first ascent of the climb. The break of the day formed out of this group early in the second lap and contained Ulster junior 25 miles time trial champion, Ruairi Power (Caldwell Cycles), Barry McKenna (Fintona CC), Kyle Fisher (Lakeland CC), Aaron Wiley (Omagh Whs), David Conor (Armagh CC) and Alan Glendinning (Island Whs). Mickey O’Kane (Termon Whs) and Conor Sprice (Lakeland CC) bridged across to this group half way round the second lap. This group maintained 40 seconds of a gap over a dozen chasers as the race reached the bottom of the final climb. Power surged clear to take the win ahead of Wiley and Fisher. FCC would like to thank all our competitors and helpers who came from near and far! Special word for our sponsors as well; Aerial Sports/Gymnastics Centre, McKenna Electrical and Arcane Bikes. On Saturday, Keevan CC hosted their Autumn classic with two separate races, results below.